I used to hate Sundays. I had to go to Sunday school. I really didn’t understand why I had to attend because my parents just dropped me off. That’s right. They didn’t even go to church. And no one asked me if I wanted to go. After they picked me up, things got worse. It was homework time until lunch. Of course, I could have done my homework on Friday night but Fridays were reserved for movies on the television and reading in bed with a flashlight until all hours. And worst of all, some Sunday afternoons were for Visiting the Elderly Relatives. In my mind, my aunts and uncles were ancient. Plus my brother, being a boy and older than me, was apparently able to take care of himself, as he always seemed to be absent from these visits. So I would sit in the living rooms of my aunts and uncles, with no toys or any other amusements, and listen to the adults talk. I now cherish the memories of these visits because they provided me with an appreciation of the social history of Montreal, as well as significant events such as the Depression and World War II. None of the McHughs had cars in those days so they must have travelled back and forth to Drummondville by train. And Uncle Thomas McHugh married a local girl. I can just imagine the McHughs, from Verdun, arriving in Drummondville for the wedding. I doubt very many people spoke English in Drummondville at the time. The culture shock must have been intense. My aunts and uncles, even into the 1960s, were thankful that they were able to have some work during the Depression. Uncle Al Scott worked for the Northern Telecom for 40 years, although with reduced hours during the Depression. Luckily Uncle Frank McHugh worked for the Montreal Tramway Company so he was able to keep working during the Depression. He was a tram driver for tram number 24 that started in Montreal West and crossed the city on Sherbrooke Street. His job was safe. My aunts and uncles loved to have a good time and the Depression did not stop them. My Aunt Elsie used to describe their card parties. There was only one bottle of scotch, some ginger ale, one can of salmon and one loaf of sliced white bread. My aunt was able to spread the salmon so thinly that she could make sandwiches out of the whole loaf of bread. It was very clear to me that the Depression was a very frightening time in their lives. During this period, the future must have seemed bleak. Life was a struggle to make ends meet. 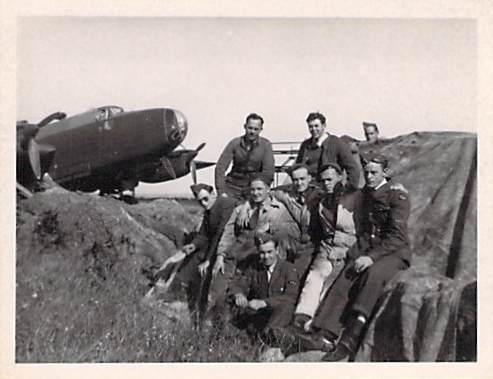 On August 18, 1943 Royal Canadian Air Force (RCAF) Flight Sergeant Colin Angus was posted as missing and presumed dead following a devastating air raid made on the missile research laboratories at Peenemunde, Germany. Forty one bombers and one fighter plane were lost that night. Colin’s plane did not return. Peenemunde was Colin’s second mission. He was initially rejected by the Air Force on medical grounds – a damaged mastoid bone, the legacy of a childhood illness. As the war took its toll, the physical requirements were downgraded. Colin was accepted and trained as a navigator. The target of Colin’s first mission was Cologne, Germany’s military command center. Other comrades and other aircraft did not return that night. “We can only hope for them”, Colin wrote in a letter to his brother Ian. Two days before Colin flew his second and final mission, he wrote in another in another letter that should he “take a cropper”‘ would Ian, also a RCAF pilot stationed in England, send from his personal effects “such stuff as should go home”. The family of the missing exist in a liminal zone. How long did my grandparents hold out hope that their son would be found? They may have reasoned that he lay wounded and yet unidentified or that he would soon be listed as a prisoner of war. How powerless they must have felt during the days and weeks and months that followed. When Colin had hovered between life and death as a child, they could hold him, soothe and tend to him. Now they could do nothing but wait. Did they rant at the unfairness? Did they make pacts with God? How did they get through the long nights when daytime activities could no longer offer a sense of normalcy and hold the pain at bay? Were they able to share their fears and support each other, or did they suffer alone, neither willing to expose their despair to the other? It took seven months for the RCAF to confirm their son’s death. On April 30th, 1944, a memorial service was held providing the family a semblance of closure. There was no coffin. His body, along with those of his crew members, had been buried in German soil far from loved ones. “Such stuff that should go home” eventually reached my grandparents. It was a very small package that included Colin’s watch and glasses. When I was sixteen, my grandmother was chosen to be Mother of Honor at the annual Armistice ceremony in Quebec City. The night before the event she carefully unwrapped the package. As I watched, she stroked each item, tears streaming down her cheeks. I was yet too young to fully understand her grief. I could only fixate on the glasses, so very fragile, and marvel that they could survive the crash that killed the uncle I would never know. Yet that uncle left me a treasured gift. The bond I had with my grandmother was forged because of his death. I have since come to understand that her joy in the birth of a grand-daughter the year following her son’s death enabled her to move beyond her sorrow. I believe that I was her salvation and the reason she held me close all her days. My father almost never spoke about the war. Despite the camaraderie and deep friendships he forged during his time of service, it was a dark period of his life and he wanted to forget about it. The few times he spoke of it, he mentioned the busy work leading up to a mission, whereby the ground crew would be working intensely to ensure that everything was the best it could be. Each person was acutely aware that a small detail could mean the difference between life and death. 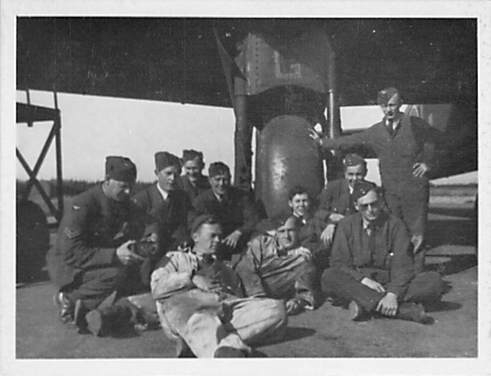 Each team of the ground crew was assigned to one bomber and they would wait for their bomber to come back after the mission. Sometimes the bay remained empty and the bomber never came back. 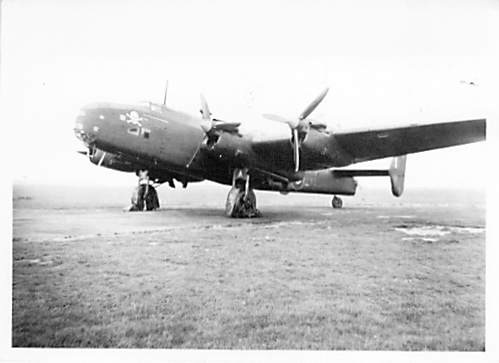 My father never got over the pain of waiting for a bomber that would not return. Ground crew. Edward McHugh, wearing overalls, is in the front.